I'm excited as can be for the start of the new school year. Here at Emerson, it's so much fun to see returning students who've grown over the summer. Some are feeling a little shy as they start the new year, wondering what it has in store, who will be their friends, what their teacher will be like. Others are excited to tell me about the books they've loved reading over the summer or seeing old favorites. Here are two books I'm excited to share with teachers and parents as they celebrate the beginning of school. "A checklist for getting ready all by myself! But soon he's watching cartoons, drinking root beer, and then smiling as his mom stands with hands on her hips. Kids will enjoy the humor in the illustrations and Eddie's shenanigans. We'll definitely be sharing this with our Emerson kids, especially as they learn to write their own "how to" lists in 2nd grade! Pete the Cat is one stylish dude. He's definitely ready for school and has a song to go along with the new year. I love listening to his song on this free download. Once I listened to the song, each time I read the story I heard it in my head - the rhythm and tune is perfect for kids to sing along. I'm rocking in my school shoes." He visits the library and is reading in his school shoes. In the lunchroom, Pete knows it can be loud and busy. "Does Pete worry? Goodness, no!" He just sings his song, "I'm eating in my school shoes, I'm eating in my school shoes, I'm eating in my school shoes." Our kindergarten and 1st grade classes are going to love how Pete goes through the routine of school, visiting each part from the classroom to the playground to bus ride home. Head over to Mr. Schu's Watch. Connect. Read. to view the fun booktrailer and listen to the song on YouTube if you'd like. Once I did, I knew this was perfect for our school! I bought both of these books from my favorite local bookstore, Mrs. Dalloway's Books. What a perfect way to start the school year! For more back-to-school books, head over to Parents Press to see my recent Bookshelf article on school stories. Also head over to Mr. Schu and Alyson's suggestions for back to school picture books. August Kidlit Carnival is Here! Hear ye! Hear ye! Step this way for some popcorn and the best posts about children's literature! The August Kidlit Carnival is being hosted this month by yours truly, Mary Ann the Librarian. 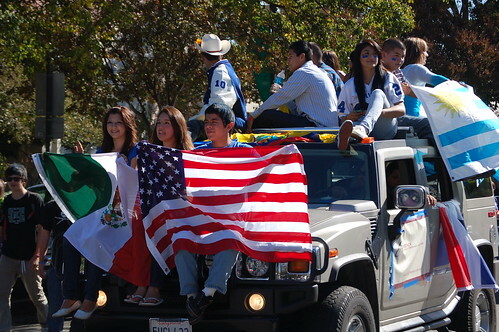 There will be a band, face painting and maybe even a parade! So read on and see what our wonderful community has to share. For those new to this shin-dig, we're especially excited to have you here. Each month, the Kidlitosphere (a community of bloggers who are passionate about children's literature) share their favorite posts to the Carnival. These are assembled for a tasty schmorgesborg of delicious reading. First up, I am really excited to be going to the KidLit Conference September 16th - 17th in lovely Seattle! I want to encourage you (yes, that's all of you!) to come join this conference. I went last year for the first time and am so glad I did. The KidLit Conference is a small affair where you really can connect with people. It was such a treat to be able to visit with folks I knew online. These in-person connections deepened our online connections. 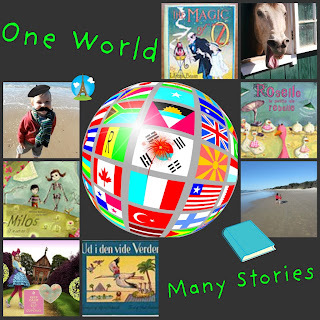 So head over to the Kidlitosphere site and find out all about it. Registration closes August 31st - so act now! A special thanks goes out to organizers Colleen Mondor, Jackie Parker and Pam Coughlan. KidLitCon Teams Up with RIF! Read Aloud Dad presents Outrageous Book Sets: The Complete Wreck - A Series of Unfortunate Events. As this dad writes, "There was no way of knowing whether this seemingly depressively-themed mega-selling book set was going to be a hit or a miss one day with my kids, so I simply decided to skip it." And yet, and yet, there was something still gnawing on him. "Why did I find the idea of this dark, moody book set so appealing - even though the principal theme of the stories seemed such a downer?" You'll love reading his very funny and very thoughtful journey thinking about whether this would be a series he'd love handing to his kids. Rebecca presents Review of A Rumpus in the Garden by Sven Nordqvist posted at Book Nerd - High Quality Book Reviews. Old man Petsson and Findus the cat have gladden the hearts of Swedish kids and parents for several decades and today the stories are translated into many languages including English. Jacquitta McManus presents Preview of Talee and the Fallen Object posted at Journey of a Storyteller. Talee is an adventurous eight year old girl that loves purple, yellow and big puffy muffins. I can tell my students would love this tale and coloring book! Amy Broadmoore presents 11 Children's Books About Stars and Space posted at Delightful Children's Books. Enjoy a little late-summer stargazing with your children. Here are eleven books to inspire children to search the night sky for the big dipper or pretend to travel to the moon. Kerry Aradhya presents Giveaway: Choose Your Favorite of Four Books! posted at Picture Books & Pirouettes. This fun blog, which is dedicated to integrating dance, movement, and children's literature, is highlighting four dance books from the independent publisher Barefoot Books, including the soon-to-be released LOLA'S FANDANGO. Stop by to congratulate Kerry on her one year blogging aniversary and enter her giveaway contest! Shirley presents A Place for Fish posted at SimplyScience Blog. Prolific science writer Melissa Stewart gives an ocean view of fish and how people can help save their habitat in this interesting nonfiction picture book. Our students are very interested in how environmental issues are affecting animals and habitats - this book sounds like it will draw them in. Over at Imagination Soup, Melissa Taylor presents Tech, Disney Fans Will Love The Kingdom Keepers Books by Ridley Pearson. Our students love his series Peter and the Starcatchers, and I'm guessing they'll love this fantasy adventure series too. It sounds like it combines elements that kids love: theme parks, evil powerful characters, and dangerous situations that only the kids can get through. Thanks for sharing it! Lisa shares a lovely reflection on Why nonfiction? (or, heard on a moonlit night) posted at Shelf-employed. 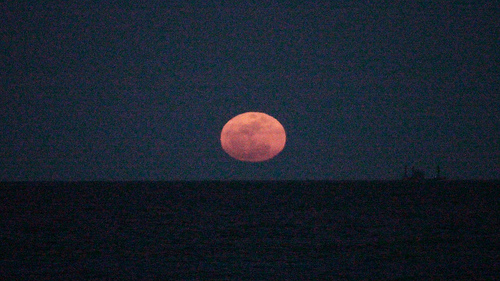 Stop by, read about this beautiful moment watching the strawberry moon rise in the night sky, and think about what sharing nonfiction with children means to you. Sally Apokedak presents Message-Driven Fiction, ruminating about the recent discussions about YA literature. I love the way she asks, "Which would you prefer: having someone stand behind you, poking you with a cattle prod, or having someone stand in front of you, holding out a carrot big bowl of ice cream?" Head over to her posts to read her interesting thoughts. 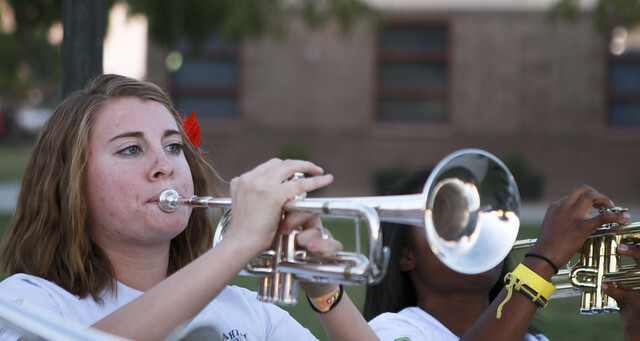 The Basha High School band plays at their homecoming carnival, October 2010., shared by Devon Christopher Adams via Flickr's Creative Commons. Pat Zietlow Miller presents A TEACHER YOU SHOULD KNOW: Abigail Swetz on building an inclusive classroom library posted at Read, Write, Repeat.. You'll enjoy this interesting interview with Abigail Swetz with her book recommendations for building a LGBTQ-inclusive classroom library - it's a great list! Jen Robinson presents The Fox Inheritance by Mary E. Pearson posted at Jen Robinson's Book Page. Jen loved this suspenseful, intriguing sequel to The Adoration of Jenna Fox - head over to read all about it. But she warns, you'll definitely want to read The Adoration of Jenna Fox first. It's impossible to review this sequel without giving away spoilers for the first book. I love the way Jen talks about this is a book that will hook readers with its dystopian setting and action adventure - but how it will also make readers think. Mindy Rhiger presents Exploring our Origins posted at Proper Noun Blog. As Mindy writes, "When you’re a kid, “how old are you?” is an important question." Older Than the Stars, a wonderful nonfiction book about cosmology, starts by turning this question into a mystery. Mindy shares this book as well as Born with a Bang, as she looks at children's books for secular families. Jeff Barger presents Animal Naps posted at NC Teacher Stuff. As Jeff writes, "When you read nonfiction to young children, it is vital that you have great visuals to pull in their eyes. If you are reading to a pre-K - 1st grade crowd, the cuter the pictures the better. You would be hard pressed to find more adorable pictures than you will see in Animal Naps." Oh, I can't wait to see this - it looks absolutely adorable! Roberta Gibson presents Seabird in the Forest: Mystery of the Marbled Murrelet posted at Wrapped in Foil. Roberta shares this fascinating story of the Marbled Murrelet birds, as well as ideas for some interesting hands on activities and a video from the U.S. Fish and Wildlife Service. These birds fly long distances, sometimes over 50 miles, from the coast inland to old-growth forests inland to raise their young. Kate Coombs is just the BEST aunt around, with wonderful suggestions over at Book Aunt. This month she shares some New Middle Grade Fantasy Books, just in time for kids going back to school. I have a group of students who adore escaping into fantasy stories, so Kate's suggestions are particularly helpful! I especially love the cover of Eva Ibbotson's newest book (published posthumously), The Ogre of Oglefort. I can't wait to read it - Kate describes it as "a delightful farewell offering from one of the most gleefully outrageous fantasy writers of the past half century." Over at The Book Chook, Susan Stephenson presents How to Celebrate Book Week. As Susan writes, "Children's Book Week is a special time we Australians have when we celebrate books and the gift of reading with kids." She shares many ideas on how families can celebrate reading with their children. Melissa Wiley presents Picture Book Spotlight: Wilfrid Gordon McDonald Partridge — Here in the Bonny Glen posted at Melissa Wiley. Oh, I absolutely agree - this is one of my all-time favorite books ever. It celebrates the bond between young and old, and how special gifts mean something to the heart. Jennifer Wharton presents Fatty Legs: A True Story by Margaret Pokiak-Fenton & Christy Jordan-Fenton, illustrated by Liz Amini-Holms posted at Jean Little Library. Jennifer writes, "I’ve looked at several different accounts of residential schools, the places where native Americans from different areas were sent to be “civilized”, in Canada specifically from the mid-1800s to the 1960s. This is the best story I’ve found so far for younger children to explain this tragic episode in history." It definitely looks like a moving story, important to share with our children. I've just put a hold on it at our local library - thanks, Jennifer. Donna St. Cyr presents 13 Curses by Michelle Harrison - Review and Giveaway. This does indeed sound like a great middle-grade/YA fantasy full of dark fairy lore. But head over to Donna's site quickly - her giveaway ends on August 28th at midnight! If you're intrigued, check out 13 Treasures, the first in the series, at your local library. Margo Tanenbaum presents a review of The Lost Crown, by Sarah Miller posted at The Fourth Musketeer. This YA historical fiction tells the story "about the last few years in the lives of the Romanovs of Russia, tells their story from the point of view of all four Grand Duchesses, the beautiful and privileged daughters of Czar Nicholas II." Margo's blog, The Fourth Musketeer, focuses specifically on historical fiction and is a treasure-trove of wonderful ideas. The Lost Crown will definitely appeal to teens I know. Cathy and Louise presents Good Sports by Glenn Stout posted at The Nonfiction Detectives. This new series "is geared towards students who can’t get enough information about people who play professional sports." I particularly like the sound of Yes She Can! about a range of women's sports pioneers. Aimed at an audience of children ages 9-12, this looks like a great addition for school libraries. Carol H Rasco presents Have You Ever Seen A Smack of Jellyfish? posted at Rasco From RIF. Really, a smack of jellyfish? How funny! Kids will love this "intersection of language and the natural world." I especially appreciate the way that Carol took a quick picture to show us the inside of the book and demonstrate it's clean lines and striking visual design. 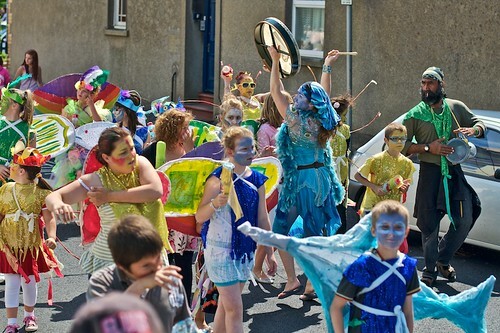 This is the Porthcawl Primary School parade from Wales, shared through Creative Commons on Flickr - what fun! Have you ever listened to Katie Davis's podcasts? She shares a wealth of information and huge doses of enthusiasm for children's books on her weekly podcasts: Brain Burps About Books. This month she's sharing her interview with Tommy Greenwald, author of Charlie Joe Jackson’s Guide to Not Reading. I had a bunch of fun listening to this podcast and can't wait to share this book with kids at our school! Over at ProseandKahn, Brenda shares a great new book for middle school boys: The Detention Club, by David Yoo. I'm so excited to read this based on her recommendation - it's just fantastic when an author gets the mind of tween boys. Brenda says, "Laugh-out-loud moments vie with the cringeworthy ones. ... He gets so much right: the terrifying eighth graders, the desire to fit in, the cafeteria hierarchy, the bewildered realization that the rules have suddenly changed." Head over to read more! Lori Calabrese presents an interview with Sue Fleiss, the author of Shoes for Me!, posted at Lori Calabrese Writes! Lori "recently reviewed Shoes for Me! and fell in love with the fun rhyme and lovable hippo that's inundated with shoes that zip, shoes that light up, summer shoes that flop and flip, and more!" In this post she shares an interesting interview with Sue, talking about her path to publication, choices for this fun story, and more. Zoe presents Save our Libraries! Reserve this book today! posted at Playing by the book. Zoe passionately writes, "Last week we were on holiday in a county where 9 libraries have had their funding withdrawn. If volunteers can’t be found (putting aside the whole issue of whether volunteers running libraries is a good thing) the libraries, more than a quarter of all the libraries in the county in question, will shut their doors for a final time within a year." I absolutely agree with her about the importance of libraries within our communities. Our local library went through a similar challenge earlier this summer. Zoe also shares a sweet book, Otto the Book Bear, by Katie Cleminson. Wendy Braun presents What do wordless books have to say? posted at Good Books For Young Souls. Wendy writes, "Wordless picture books remind us to listen with our eyes. They speak in their silence, unfolding imaginative tales -- with captivating illustrations that communicate everything from quiet experiences to exciting adventures. Wordless books help children learn to focus on the sequence of events, as they notice the details of the pictures, allowing them to use their imaginations to help tell the story." I absolutely agree and love the selection of wordless books she shares! Valarie Budayr presents The Friendship Doll posted at Jump Into A Book. From the author of Hattie Big Sky, Kirby Larson weaves a brilliant tale about a beautifully created Japanese doll, Miss Kanagawa. Her story will take you from New York to Oregon, during the Great Depression. Meeting wonderfully rich characters along the way at each stop. This lovely book was my personal favorite of the summer - had my crying and smiling at each step. Thank you, Valarie for sharing! I love the origami friendship doll craft you suggest! Carmela Martino presents Ten Reasons Why I Heartily Recommend WRITING YOUNG ADULT FICTION FOR DUMMIES posted at Teaching Authors--6 Children's Authors Who Also Teach Writing. Esther Hershenhorn reviews Deborah Halverson's book, saying, "Comprehensive. Thorough. Clearly-written. Insightful. Those are but a few adjectives that describe this guidebook." Great recommendation, indeed! In a timely post, as so many children go back to school with new teachers and new classrooms, Danette Schott presents Harry the Happy Caterpillar Grows: Helping Children Adjust to Change posted at Help! S-O-S for Parents. As Danette writes, "Children feel safe with stability and sameness. The idea of change can bring about stress. But for a child with special needs, change can be that much more difficult. When a child with special needs has figured certain things out in his life, change can appear to be too challenging and he does not want to have to start all over." She highly recommends this book as a way to talk about change with children. Sandie Mourão presents A bit lost: a psychedelic delight posted at Picturebooks in ELT. I love Sandie's way of digging into the visual rhythms and choices that author/illustrator Chris Haughton makes. Fascinating, detailed writing about this picture book! At first it seems like a delightful, simple book, but there's so much more to think about at each step of the way. Thank you, Sandie, for sharing! Jackie Castle presents A City Across Time - Adventure Activities posted at The Castle Library. Purpose of Jackie's blog is to help parents, teachers and home schoolers find new ways to make reading fun and adventurous. In this post, she shares fun ideas about looking at the places we live across time. I particularly liked the suggestion for printing a paper city - my kids would love that! Nichole presents Shape Art Activity - Bear and Tractor posted at Just Children's Books!. This fun activity was inspired by Bear in a Square and Driving My Tractor, and looks like a lot of fun! Anastasia Suen presents STEM Friday: Junior Scientists: Experiment with Heat posted at Chapter Book of the Day. These are some great experiments to try in this hot weather! Our kids love hands-on science experiments. Thanks for sharing this series - we'll definitely check it out! Jama Rattigan shares her picture book crush on I Had a Favorite Dress by Boni Ashburn, illustrated by Julia Denos, posted at Jama's Alphabet Soup. Oh Jama, can we have a crush on the same wonderful book? Does that bring us closer or make us rivals? I'm hoping it means we both are filled with big smiles each time we read Boni and Julia's lovely book. Twirling with delight, indeed! Rebecca Ryals Russell is excited to announce the release of Zarena, Book 1 of Stardust Warriors, her new middle grade series, posted at Under the Hat of a Middle Grade/Young Adult Fantasy Author Rebecca Ryals Russell. "14-year-old Zarena wakes one morning in the home of the Conscientia, a Holy Order living on Revrum Natura." Exciting fantasy adventure worth checking out. Myra from GatheringBooks shares a fun round-up of her reading and reviews for the month at her Carnival of Children's Literature and Round-up for August. I love all her posts about fractured fairy tales. Myra's done an impressive amount of reading this month, participating in several reading challenges. Thanks for sharing! That concludes this edition of the Carnival of Children's Literature. Submit your blog article to the next edition of Carnival of Children's Literature using our carnival submission form. Past posts and future hosts can be found on our blog carnival index page. (Yes, we have been around since 2006!) For an email reminder of the location of the next carnival and announcement when it is posted, subscribe to the Carnival of Children's Literature reminder blog. Cats vs. Dogs: who's on top?